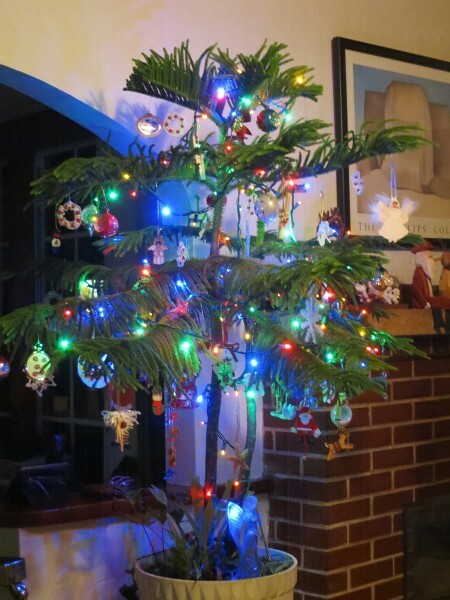 For the last 8 or 9 years, our tree has been a Norfolk pine in a pot on my pool deck. Another year’s growth made it too big to carry inside, so I was stalling with decorating, until last Saturday. I attended a supper that had a white elephant swap for Christmas. 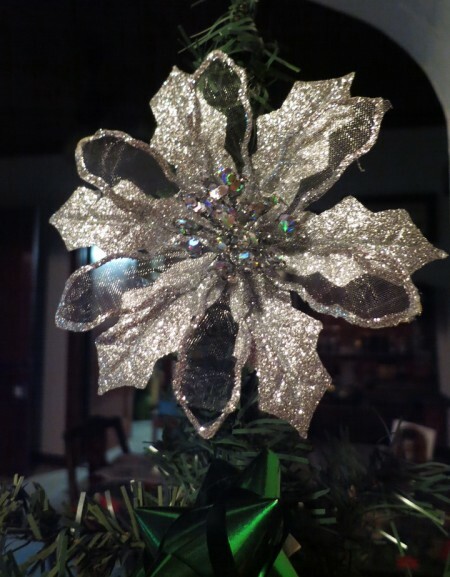 My gift was an artificial, 4-foot tall, pre-lighted tree in a pot… stuffed into the original box which was taped up with several layers of packing tape to keep it all together… enough tape to prove that it must have been used for several years. Well, I didn’t have one! Tonight, grandson Malcolm was tasked with taking it out of the box and unbending the limbs into a tree-shape suitable for Christmas. He did his best, but it still looked scrawny. 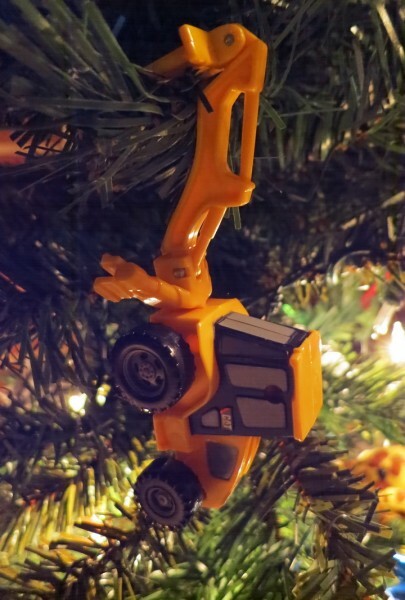 That’s okay, because we decided it was a Charlie Brown tree. 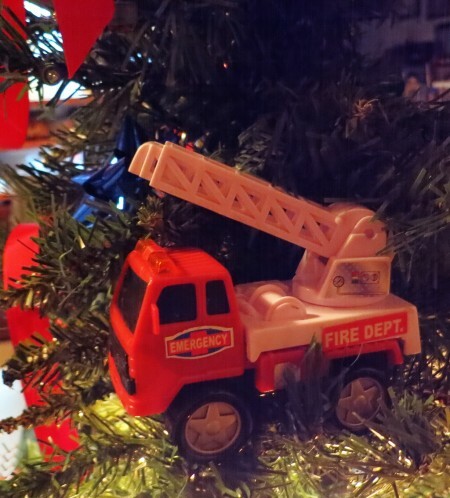 We set it in the usual Christmas tree space in the living room and plugged it in. The lights came on first time… on the bottom half of the tree. 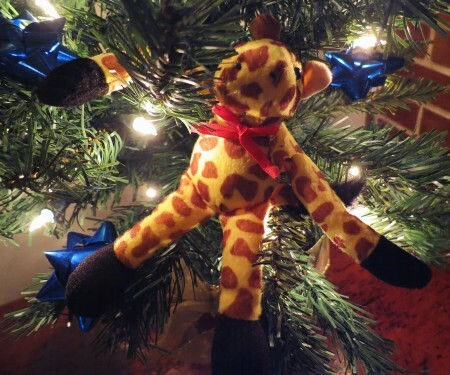 The wires had been cut and tied together at some point, so there would be no warm glow from the top half of the tree. That’s okay. It’s a Charlie Brown tree. Since we did not bring in the big tree from previous years, I did not bring the boxes of ornaments down from the attic. Instead, I used what I found in different drawers and the grandkids’ toy box. 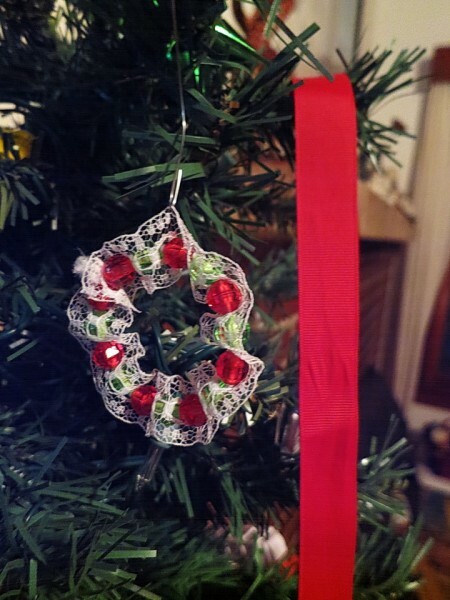 I found a single wreath ornament that missed being boxed last year, a piece of red ribbon in the wrapping paper drawer, a bag of stick-on bows left from last year, several small toy trucks and a clip-on silver poinsettia… all of which are now residing on the tree. The pièce de résistance was ‘Chester the Tall Goat’ (actually, a giraffe) that Malcolm got from his teacher today. He will be leaving when Malcolm goes home tomorrow, but that’s okay. It’s a Charlie Brown tree. 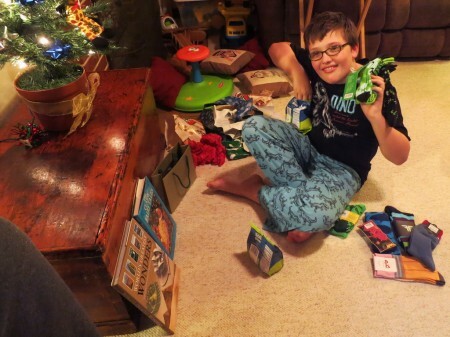 Since Malcolm will not be in town for Christmas, we celebrated his Christmas tonight. We considered it a dry run for the big day. It worked beautifully! 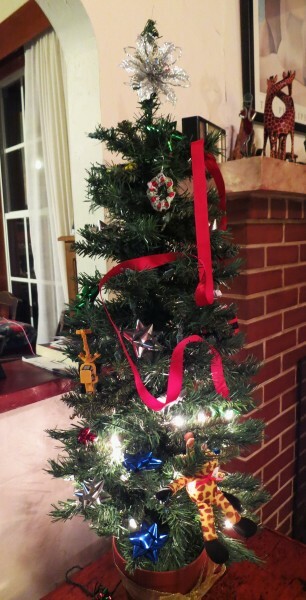 I think this is the best ‘Charlie Brown’ tree we’ve ever had. 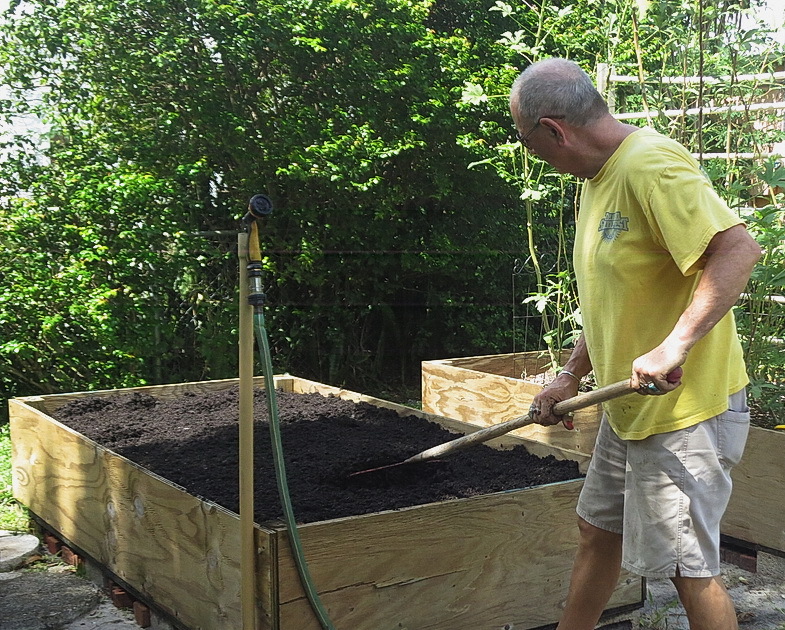 Today we prepared the garden boxes for the 2014 fall planting season. First on the list was the herb box. It’s been almost two years since the herb box was planted. Most of the herbs were way overgrown. They had spread out everywhere and many had become very woody. The herbs needed to be thinned out and cut back. Gardening buddy Bill and I cut all the herbs down to the ground, leaving a few leaves on what was left. They will come back fast and will be healthy. 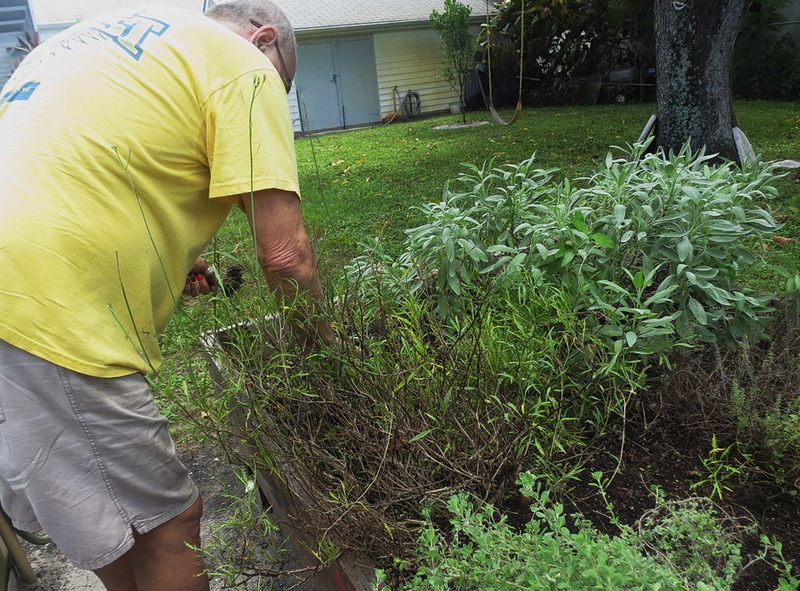 We had a pile of herb clippings about two feet square when we were finished. We removed the plastic sheeting used for solarization from the middle box. 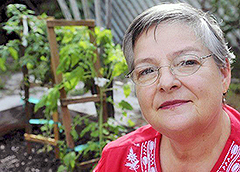 We do not cover the herb box, because most herbs are perennials. We usually cover the other two boxes from sometime in August until the beginning of October. However, this year, only one box was covered. The okra planted in the extra the box behind Bill (who 5’10”) has grown to over 7 1/2 feet tall (never seen that before) and is still flowering and producing. The okra is doing so well that we are going to leave it until we get ready to plant tomatoes against the white tie-up bars. Each year, the boxes lose soil from wind, rain and pulling out plants. To keep enough depth for root growth, the soil must be replaced. It takes about half a dozen bags of soil to do this. 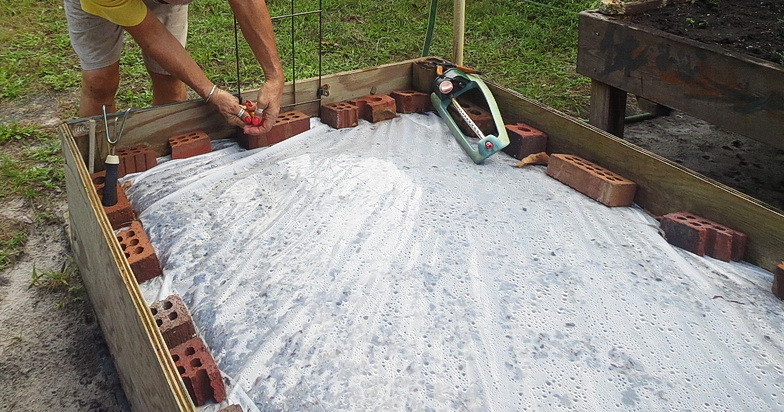 *A hint that works well… cutting the soil bag across each end and down the middle allows the dirt to be spread easily. 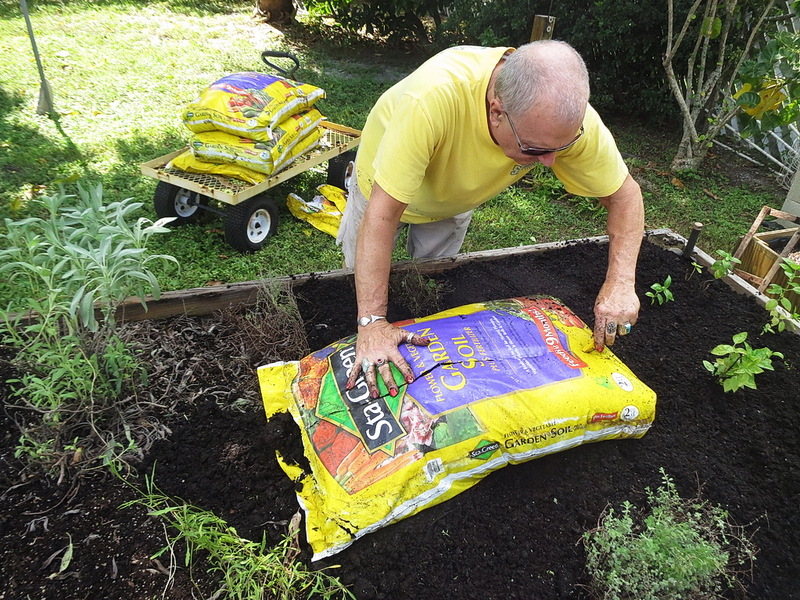 Just pull on one side and roll the soil off into the garden. 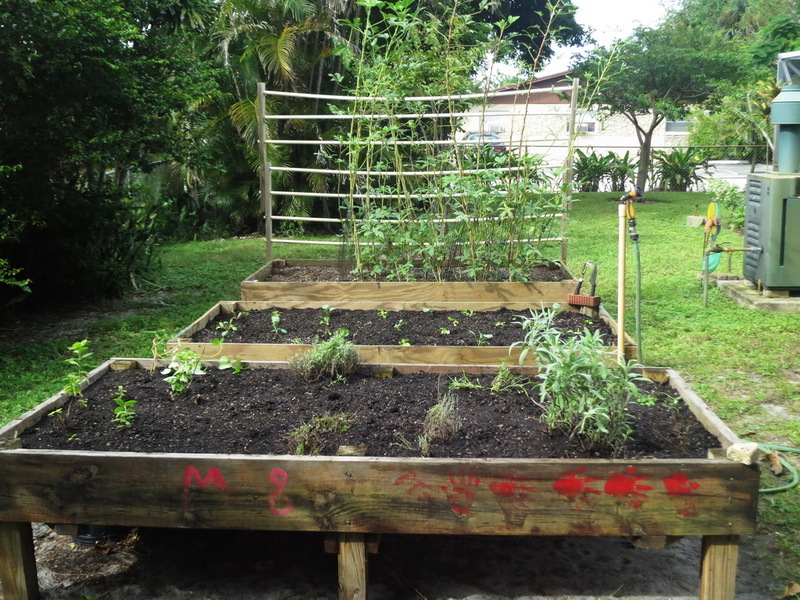 Once the new soil is added, rake it out flat, spray water on it to level it and begin to plant. The only herb we replaced was the parsley. We’ve decided not to grow cilantro again. It really does not do well in this garden, and fresh cilantro is relatively inexpensive to get elsewhere. This year, we have nine broccoli plants with Swiss chard planted all around the broccoli in the rest of the box. Broccoli grows tall and bulky. There is plenty of room to grow chard all around it. Once the broccoli is finished and is pulled up, the chard will continue to grow in the box. We bought tomatoes, but the plants were dry and rather limp. They needed to be watered and given a few days to recover before they are planted. So far, things are going well. I’m looking forward to another season of fresh vegetables. Back in August when the other garden box was covered to solarize it for the remainder of the summer, the okra was still coming up strong. Since we don’t plant again until October, we decided to leave the okra until it quit producing. Not only is the okra still producing, but it keeps on blooming! I know okra tolerates heat much better than anything else I grow, but, besides producing scads of okra, some of the plants are now 7-feet 4-inches tall using a tape measure. 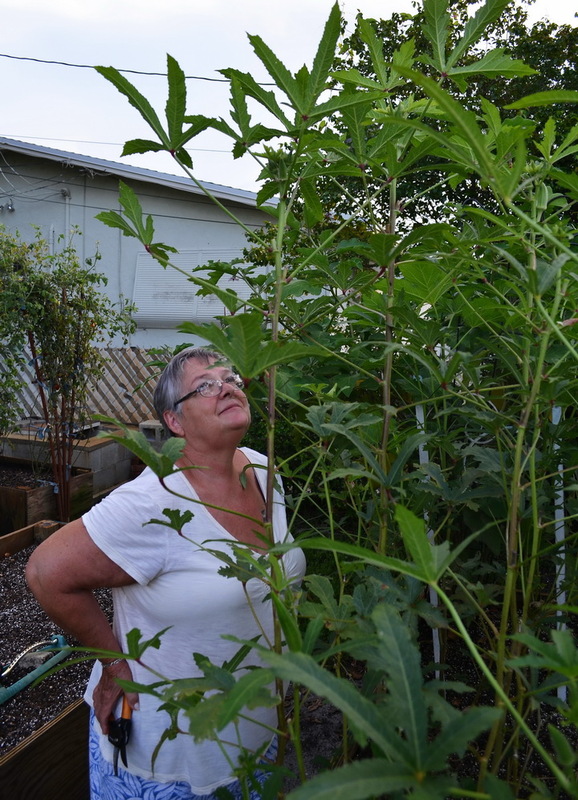 I have never, ever had okra plants grow that tall. I have to pull the plants over sideways to bring them down low enough for me to cut the okra. 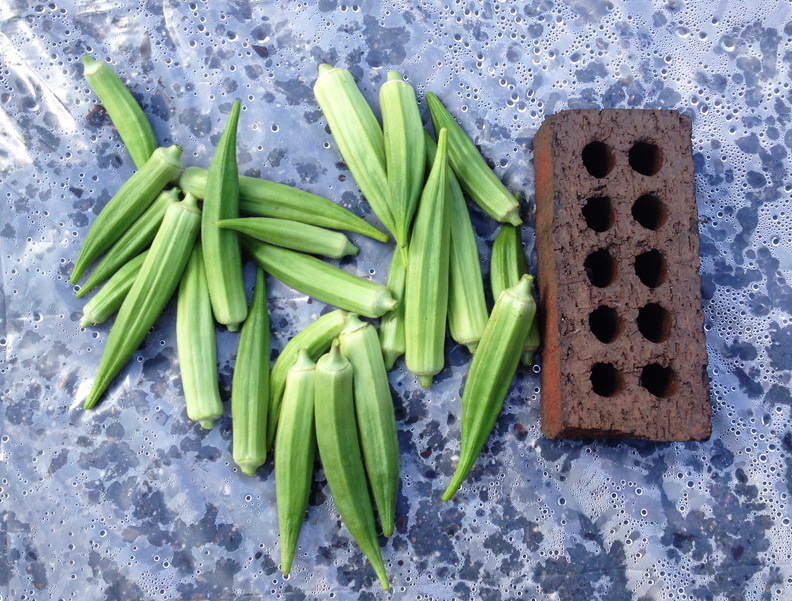 Over the last eight weeks, I have cut more okra than I ever expected to. I have pickled okra, fried okra, put okra into gumbo and given away okra. I really like okra, but there is so much of it. I guess I will have to get new recipes off the internet. 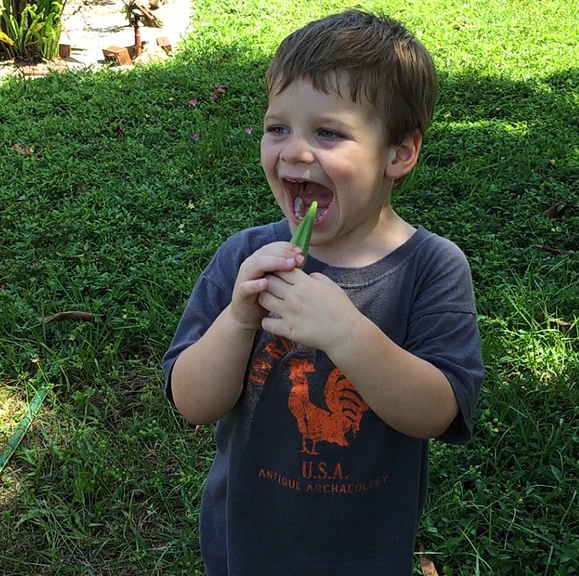 Today, 3-year old grandson Graham came to visit and discovered okra. He saw me cutting it off the plants and wanted to help. I placed the cutters on the okra and let him squeeze them together to cut it. 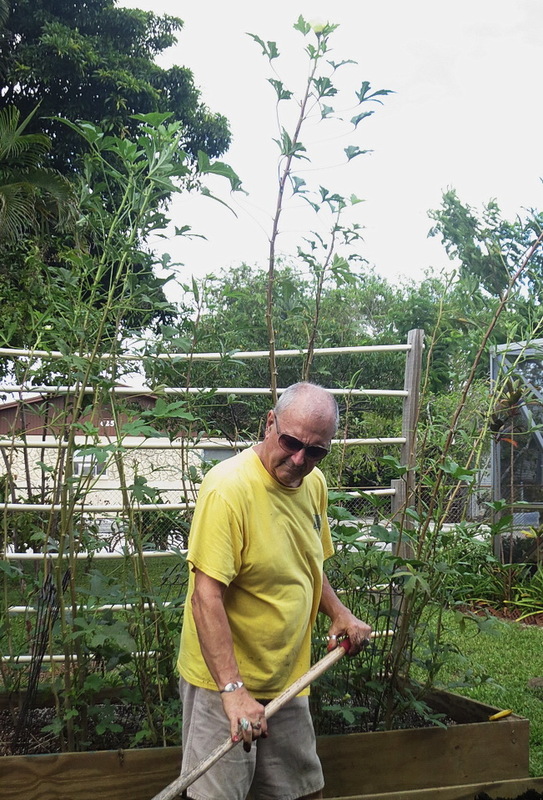 With a little help, he cut an impressive bunch of okra. He piled up the okra and decided it looked really good. I washed a small piece and he bit into it. It was a winner. He ate two pieces right off the plant. He knows good stuff when he tastes it. Graham’s Uncle Matt and Aunt Sarah (a former Okra Fest Queen) attend an okra festival near Orlando every year in October. Looks like Graham could be a tag-along for the next one. Tags: above ground garden · Okra · Okra Festival · Raised Garden · soil solarizationNo Comments.